This is a very simply chicken marsala with portobello mushrooms. 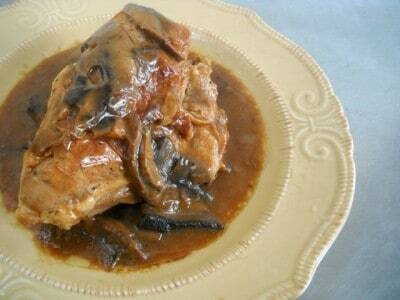 When you make chicken marsala, make sure to spend a little more on the wine, it will make a world of difference. Do not buy the marsala cooking wine in the part of the grocery store where the generic cooking wines are located. Make sure to buy your marsala wine from the wine aisle. I like Sheffield’s. Also make sure to use a more flavorful mushroom like the portobello or baby bella’s. I usually like to make lots of the marsala sauce to toss with pasta, but on this occasion, I just wanted something a little more simple. I served this with roasted sweet potatoes and broccoli. Salt and pepper chicken. Preheat skillet. Drizzle with olive oil. Brown chicken on both sides over medium heat. Remove chicken. Add mushrooms and a little kosher salt. Saute until tender. Remove mushrooms. Turn heat to low. Add butter and melt. Whisk in flour, and cook for 2-3 minutes. Add wine. Turn heat to high and continue to whisk until sauce thickens. Then add mushrooms and chicken. Let this simmer for about 20 minutes covered before serving. I love a recipe that I can memorize and remember all of the ingredients when I’m at the store. I also love the simple method. And who doesn’t love Chicken Marsala!? If I’m reading correctly- about your photography- this last shot shows how much better your getting. The highlights/lighting are great, the composition/cropping and the background/plate color combo. I love photography but I struggle with my lighting. I usually end up asking my husband to come help. But one day I’ll get it right! That looks really delicious. I try to send you a note on Twitter and a “New and Better Day” in response to your peace and happiness. Thank you. Sometimes my twitter doesn’t want to update so I’m sending it to you here that you’ll have a new and better day, not only for today but every single day. thanks, I did get your message through twitter, have a great day! Astonishing dish especially while served with a glass of white wine, mmmmmmm.I think I know what I am going to do tonight. .-= Cynthia´s last blog ..7 Best Ways to Improve Your Credit Score =-. Sources just like the one a person pointed out here may end upward being really good for me! I will put up a hyperlink for this web page on my small weblog. I’m particular my visitors will see which very beneficial.